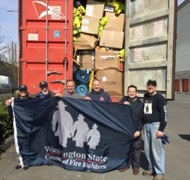 The Rotary Club of Lake Forest Park has partnered with the Washington State Council of Firefighters, fire departments throughout the state and the Peruvian Consulate, located in Lake Forest Park, on a project to collect, store, and transport retired firefighter gear and equipment to Peru. The Peruvian Consulate General, Miguel Angel Velasquez Garcia, who helped load the gear and equipment into the shipping container along with members of the Rotary Club of Lake Forest Park and the Washington State Council of Firefighters, noted that this shipment is the largest donation of firefighter gear and equipment ever transported to Peru. He estimates that the value, if new in Peru, would be a minimum of $750,000. 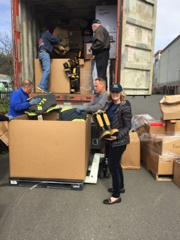 Once the shipment arrives at the port near the city of Lima, the gear will be distributed to fire departments in rural areas of Peru that are not able to afford or access the gear and equipment they need. Rotary brings together a global network of volunteer leaders dedicated to tackling the world’s most pressing humanitarian challenges. Rotary connects 1.2 million members of more than 34,000 Rotary clubs in over 200 countries and geographical areas. Their work impacts lives at both the local and international levels, from helping families in need in their own communities to working toward a polio-free world. For more information, visit Rotary. Meetings of the Rotary Club of Lake Forest Park are held every Wednesday morning for breakfast at 7:15am at the Lake Forest Park Presbyterian Church, 17440 Brookside Blvd. NE, Lake Forest Park. All are invited.